It's been a momentous decade for technological advance. Read on to see how far we've come and reminisce about a time where things were simple; that’s right - 2003. With an influx of anniversaries recently - the fortieth year of the cell phone, the twentieth year of the internet and the tenth anniversary of tech tools that have become an integral part of our life, like iTunes and Skype - we’ve taken a look back at the past ten years of technology. Read on to feel old and amazed in equal measures. You were probably also strolling around showing off your new Nokia 1100. Features included SMS to many, a calculator, a torch, enough memory for 50 contacts and of course the ability to make those awesome self-composed ringtones. Up until relatively recently, the Nokia 1100 this was still the best selling consumer electronic device in the history of the world, shifting 250 million units since 2003. And guess what - it's still the world's biggest selling phone of all time. 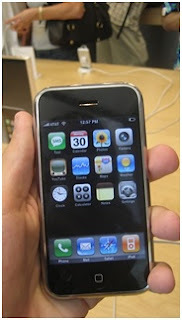 Fast forward to 2007 - the first iPhone appeared, changing our lives forever. Boasting a 2.0MP camera and a 3.5-inch screen, this phone was the dog's danglys, and Apple shifted over 1 million of them in the first 74 days of sale. But six years later - a lifetime by tech standards - and its bye bye generation 1. This year, the original iPhone will officially be considered "obsolete" or "vintage" by Apple retail stores and service providers, with replacement parts no longer available. Today, the newest version of the iPhone can hold roughly 28,000 music tracks, run thousands of apps, record high quality video and keep us connected wherever we are. Modern phone services are completely unrecognisable compared to ten years ago, with internet messaging and video calling available on a multitude of devices at any time. In 2004, Larry Page and Sergey Brin sold Google shares to the public for the first time, making search an integral part of life and turning the company name into both a noun and a verb at the same time - the ultimate sign of market dominance. And dominate they do, today holding around 80 per cent of the market share despite competition from Yahoo!, Microsoft and a fleet of other search engines. If you're anything like me, your first internet friend was some guy called Tom and you spent a couple of years assessing your self-worth according to how many top eight friend lists you appeared on. But social media has blown out of all imaginable proportions since sites like MySpace and Friendster blasted onto the scene in 2003. Since Facebook and Twitter opened up to the masses in 2006, social media has brought us together in a way that was almost unimaginable ten years ago. Stemming from a few early tentative steps, we have now witnessed tweets from space, the President of the United States and the Pope. 9100 tweets are now sent every second, although Facebook still dominates the social world, chalking up its billionth user late last year. In 2003, you might have landed yourself a new Game Boy Advance SP from Santa if you'd been really good. But with a market already saturated with PlayStations, Xboxes and GameCubes, you probably already had all the consoles you needed. That was, until the biggest change in video game technology we've seen in the past decade. The 2006 release of the Nintendo Wii brought motion controlled gaming to the mainstream and transformed how video games could be played. Interactive fitness games opened gaming up to a new demographic, with everyone from your brother to your granny wanting a shot at hitting an imaginary tennis ball. In 2005, a major step was taken towards the internet's destiny as a hub of user-generated content. YouTube launched, giving the average person free reign to upload their own videos for the world to see. At the same time, sites like Wikipedia were gaining momentum and bloggers started emerging from every corner of the earth to cast aspersions and give freedom of speech a whole new outlet. There was no longer anywhere to hide. The people had taken over. From the first YouTube video showing a few elephants at the zoo, the site has snowballed out of all proportions, now boasting 1 billion unique visitors every month, 72 hours of video uploaded each minute and over 1 trillion views a year. So what is the future of technology in the next few years? Will Google glasses take off, superimposing digital information on the real world? What about smart watches, 3D phones and social media messages that self-destruct? If the last ten years are anything to go by, then this could just be the start. Watch this space.